Choose from a variety of sizes, and inside materials. *Silver reflects the greatest amount of light back to the subject, brightens the image and creates the most contrast and the hardest light of all coated-liner umbrellas. Available in two sizes—32” (27” inside) and 48” (37” inside). 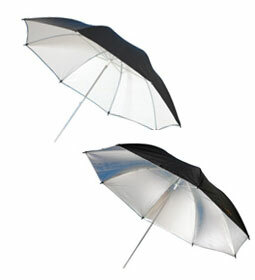 *Gold/White Umbrella provides the same amount of contrast as our Silver/Black Umbrella but with a warmer tone. It works well for outdoor shots needing flash/sun balance. Two sizes—32” (27” inside) and 48” (37” inside).